1. A recognized medical qualification included in l or II Schedule or Pan II of the 3rd Schedule (other than the licentiate qualifications) to the Indian Medical Council Act 1956 Holders of educational qualifications included in Part-Il of the 34th Schedule should fulfill the conditions stipulated in subsection (3)of the Section 13 of the Indian Medical Council Act. 1956. 3. MD/MS in any clinical specialty with 3 years’ experience in Hospital administration of a 200 bedded hospital. A Degree from a recognized University / institution with a PostGraduation/ Diploma in Public Relations / Corporate Communication / Journalism / Mass Communication with 10 years’ experience in the field of Public Relations / Corporate Communication / Journalism / Mass Communication. Graduate in Commerce with at least 55% in aggregate. Experience: 3 Years’ experience in Supervisory capacity in Govt. Organization. Desirable : Chartered Accountant/ Cost Accountant or MBA (Finance). 1. Degree in law or equivalent. 2. Should be a qualified legal practitioner with experience of minimum period of six years. M.Sc. (Home Science – Food and Nutrition)/M.Sc. (Clinical Nutrition and Dietetics)/ M.Sc. (Food Science &Nutrition)/M.Sc. (Food and Nutrition Dietetics)/M.Sc. (Food Service Management and Dietetics) from a recognized University/Institution. and 6 years’ experience in the line preferably in 200 bedded Hospital. The aspiring applicants satisfying the eligibility criteria in all respect can submit theirapplication through ON-LINE mode only. 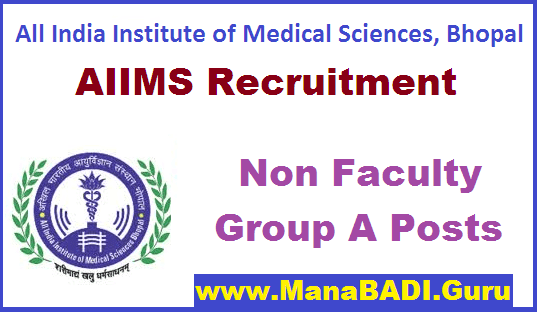 The On-line registration of application is made available on AIIMS, Bhopal official website i.e. http://www.aiimsbhopal.edu.inThe link for submission of online applications in respect of above said posts along with other relevant information will be activated from 03.03.2018 (Saturday). The last date of online submission of applications will be 01.04.2018 (Sunday). Rs. 1,000/- (Rupees One Thousand Only). The applicant should pay prescribed application fees through On-line mode only via payment gateway ofAIIMS, Bhopal. Transaction/ Processing fee, if any, as applicable will be payable to the bank by the applicant. Application fee once remitted shall not be refunded under any circumstances. Only SC/ST/PWD/Women Candidates are exempted from payment of application fee. Interview and / or Written Test, depending upon the number of candidates.